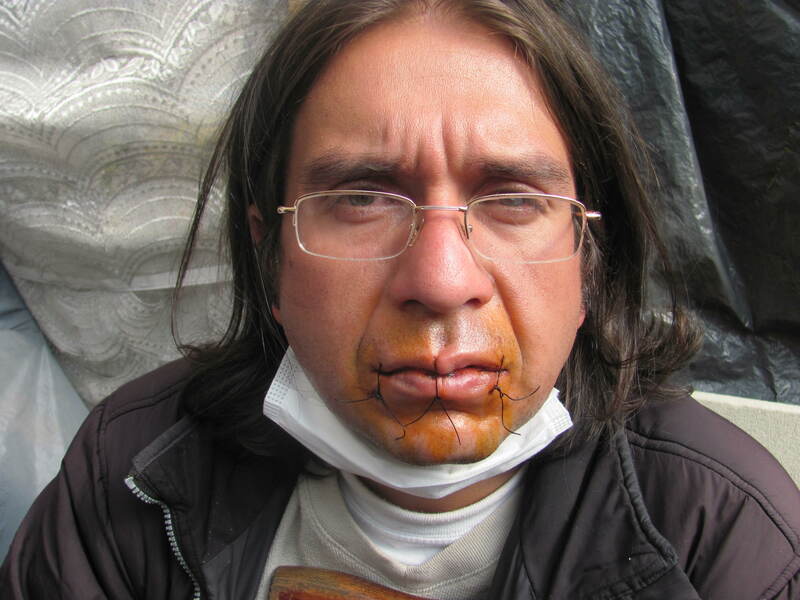 Injured workers from the General Motors Colmotores assembly plant in Bogota, Colombia, after a year occupying the sidewalk in front of the U.S. Embassy, sew their lips shut in hunger strike they are determined to carry out until General Motors Colmotores resolves their situation. They are prepared to give their lives so that workers do not continue to be exploited by multinational corporations in Colombia. Four workers injured from the General Motors Colmotores assembly plant sewed their lips shut on August 1, 2012, initiating the hunger strike that their association has now carried out for the past 12 days. This escalation comes a year after they set up tents and a makeshift shelter and began to occupy the sidewalk in front of the U.S. Embassy in Bogota, Colombia. They have maintained this peaceful protest day and night for the past 377 days- demanding that General Motors Colmotores resolve their desperate situation. The debilitating injuries that these men are suffering, mostly involve their spinal columns and upper and lower limbs. They claim to have acquired these injuries from their work on the production line, citing the repetition, excessive weights, harmful body postures, and accelerated pace of the work. After developing the injuries which were detected in the company medical facility, they say they were essentially kicked to the street, left without an income, compensation, medical care, or severance. 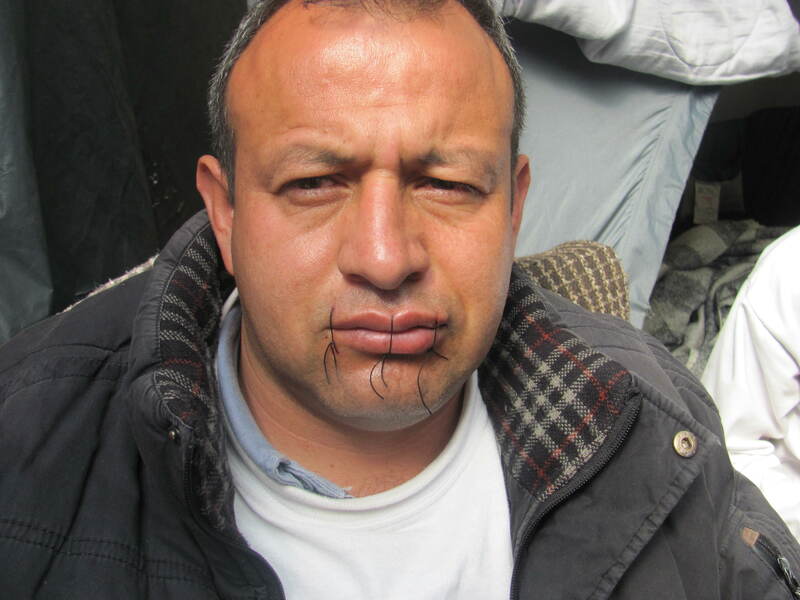 In addition to having permanent injuries, these men claim to have been illegally fired from their jobs, an assertion that has been verified by the investigation of the Inspector General of Colombia. General Motors Colmotores denies the allegations of ASOTRECOL, stating that the company has never fired workers due to their physical health and states that the company respects the law. Questions around whether the company has broken the law have emerged after recent investigations have resulted in the temporary removal of a government labor inspector for falsifying documents. Additional labor inspectors are being investigated, as are accusations that the falsification of documents was done with the collusion of the company lawyer and because of bribes received from General Motors Colmotores. It has already been several years since many of these workers lost their jobs and in this time they have found it very difficult to get work. The workers claim that no company will hire individuals who need a cane to get around or who have obvious injuries. Those whose injuries are less apparent have found it impossible to maintain a job once their injuries are aggravated and their pain starts to flare up. Their families have suffered: enduring hunger, having critical services like water cut off due to their inability to pay, going without needed medical care, losing their houses to foreclosure, and seeing their dads and husbands unable to participate in family life as they once did. The injured workers point to the bailout that General Motors received in 2008, saying that money from workers in the U.S. should not be used to destroy the well-being of workers in Colombia. With partial ownership of General Motors remaining in the hands of the U.S. government, this hunger strike raises the question of just how much say we the people of the U.S. should and do have over the outcome of this situation. Despite being a continent away, the struggle of these workers against the abuses of a multinational corporation is the struggle of the people of this country against corporate personhood; the struggle against exploitation and the creation of poverty; against commercial media that fails to report on stories that could jeopardize their advertising dollars. In Colombia, General Motors Colmotores has a lot of power. When reporters have covered this story they have often failed to refer to General Motors Colmotores by name, instead identifying it as “a well-known multinational automaker.” It has received scant attention in the U.S. as well. It is this silence that is allowing General Motors to be non-responsive on this issue. Please help bring visibility to this situation by sharing this article, telling your friends and organizations, and using social media outlets such as facebook and twitter to publicize it.